Interplay Games :: Guess Who? Two players or two teams sit opposite each other with all their character cards upright on their Guess Who tray. The teacher selects two characters from the yellow card deck and puts them in the front of each team's tray. 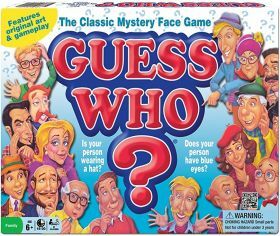 The opposing teams have to ask questions requiring only "Yes/No" answers of the other team in an effort to guess who the character is. For example, “Is your person wearing glasses?” If the answer is NO, then the team turns down the character cards wearing glasses. The first team to put down all their characters and guess the other team’s character WINS!